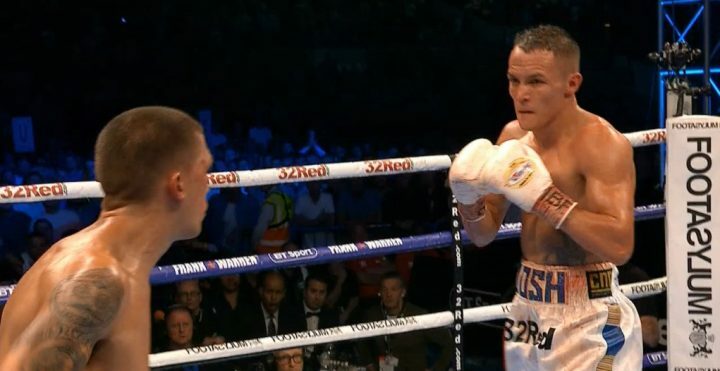 By Tim Royner: Josh Warrington (27-0, 6 KOs) used steady pressure to wear down a weak and slow-looking IBF World featherweight champion Lee Selby (26-2, 9 KOs) in beating him by a 12 round split decision on Saturday night at the Elland Road Football Ground in Leeds. The judges’ scored were 115-113, 116-112 for Warrington and 115-113 for Selby. Boxing News 24 scored it 116-112 for the 27-year-old Warrington. From the start of the fight it was clear that Selby was going to be too slow and weak for him to win without him using his brains and staying on the outside. Selby, 31, thought he could slug with Warrington, and that was the wrong decision for him to make. It was a move that went against Selbys basic DNA, which is for him to hit and move for 12 rounds. Tonight, Selby tried to slug, and boy did he pay for it. Using the same roughhouse fighting tactics that Jeff Horn used in beating Manny Pacquiao last July to win the WBO welterweight title, Warrington roughed Selby up all night long. There were countless head-butts and rabbit punches from Warrington in the fight. Selby made it possible to be head-butted and rabbit-punched by his decision to brawl with Warrington. It didn’t take long for Warrington to open-up two cuts over Selby’s eyes from his head-butts. The head-butting was accidental, but with the way that Warrington was charging forward head first like a Billy Goat, it was hard not to see this as intentional. Warrington used a win at all costs approach to the fight, and it there was no way that Selby was going to be able to compete with that style without jabbing and moving continually to keep from getting head-butted and rabbit-punched to oblivion. Selby fought well in rounds 3 and 8. The remainder of the rounds were dominated by Warrington with is combinations and flurries. Warrington was landing the harder punches throughout the fight. In the 12th, both fighters unloaded with everything they had to win the round. Warrington got the better of the action in landing some hard shots. Selby was out of his element trying to slug. That’s not his style. Selby seemed to be really bothered by the cuts, rabbit punches and from the head-butting by Warrington. Selby should have realized that he was fighting in Warrington’s hometown, so he was going to tough it out no matter what. He wasn’t going to have a referee that penalized Warrington. It wasn’t going to happen. Selby should have adapted and fought smart instead of continuing to slug. The way that Warrington looked tonight, he would have been destroyed by Gary Russell Jr., Oscar Valdez, Scott Quigg, Leo Santa Cruz, Abner Mares, Joseph Diaz Jr. and Genesis Servania. Warrington had enough to beat the feather-punching Selby, but not the good fighters in the division. The win for Warrington now puts him in position to face Carl Frampton (25-1, 14 KOs) next on August 18 at Windsor Park in Belfast, Northern Ireland. If Warrington didn’t suffer any injuries, he should be able to get back into the ring soon to start getting ready for a fight against Frampton.